As a former player at Arizona State University (ASU) and current member of its alumni board, Zee Khan has seen the evolution of the Sun Devils’ hockey program up close and personal. Progressing from a pedestrian club team to an American Collegiate Hockey Association (ACHA) Division I national champion to this season competing in the NCAA Division I ranks, Khan – now the general manager of the University of Nevada-Las Vegas (UNLV) program – is armed with the task of rewriting that script for a club that’s settled for mediocrity for far too long. “The last few years the program has been on a downswing, and they really wanted to put somebody in here who was looking to grow it versus just being there,” Khan said of the ACHA Division II team. Starting with upping its recruiting efforts with gusto. The Skatin’ Rebels brought in nine freshmen this season – all of whom played competitive hockey prior to their arrival on campus. Among the newcomers is forward Bryden March, who last season captained the Salmon Arm Silverbacks of the British Columbia Hockey League. “We’re actively recruiting, and it helps that we’ve brought in kids who have strong playing backgrounds, who are used to the structure and culture of successful programs,” said Khan, who grew up playing in Valencia, Calif.
“In the past, the club was hoping for kids to come to tryouts and go from there. This year, we didn’t want to sit around and hope for kids to enroll in school; we went out and actually got them. That approach, Khan says, is a page taken straight out of the Sun Devils’ playbook. “That’s what (Sun Devils head coach Greg) Powers did at ASU; he was actively recruiting, he was bringing kids in from all over the place, making ASU an option for kids looking to play collegiate hockey at a high level,” said Khan, who credits Powers for his assistance in helping navigate the revitalized UNLV program. 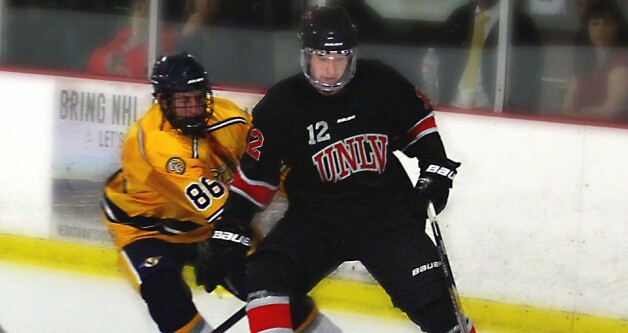 UNLV, which cracked the top 10 of the Western Region this season for the first time in fours years, is also benefiting from an amped-up game schedule, competitively speaking, and the strong leadership of its new head coach Anthony Vignieri Greener and assistant Nick Robone – both UNLV graduates – as well as its new home at Las Vegas Ice Center. Previously playing out of SoBe Ice Arena, the Skatin’ Rebels now have their own dedicated locker room at the Ice Center and are attracting 300-400 a game in attendance, says Khan. Working collectively with the Ice Center’s youth program – the Nevada Storm – has also yielded benefits, as well as the NHL ownership group that will soon call Vegas home. “UNLV has the name, has the brand,” said Khan. “Visibly, we’re in the community a lot, and hockey in general has grown a ton here. The local support has been great – and that’s a big part of it; we’re really growing the game here. And word is spreading fast that the once-also-ran UNLV program now means business. “Talking to other coaches, other programs, everybody’s kind of taken notice of the immediate changes we’ve made, which have been pretty dramatic and a lot faster than I anticipated, to be honest,” said Khan.